Research Infrastructures (RIs) are increasingly focused on creating a continuum between discovery and market applications. 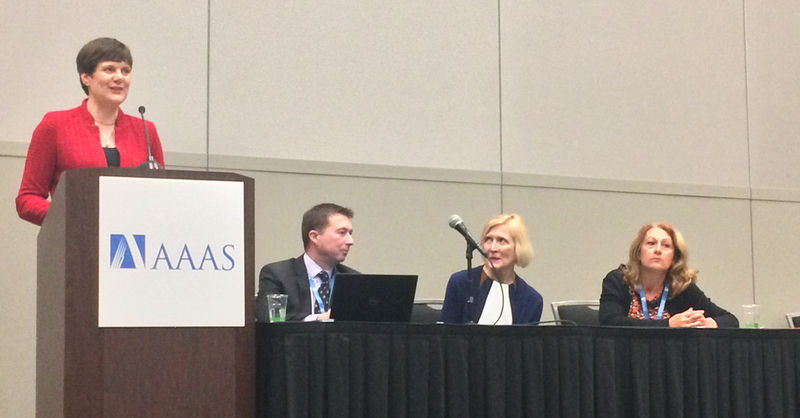 To explore how different RIs foster innovation and how they are building collaborations with industry, representatives from several international organisations – including two EIROforum members – participated in a Symposium Session during the American Association for the Advancement of Science (AAAS) meeting held in Austin, Texas, this month. Silke Schumacher, Director of International Relations at EMBL, the discussant during the session, which touched on a range of topics, including the role of industry, emerging training needs and non-economic factors driving innovation. The speakers were Edward Mitchell, Head of Business Development of the European Synchrotron Radiation Facility, Roseann O’Reilly Runte, CEO of Canada Foundation for Innovation, and Kathrina Maes, Deputy Secretary-General at the League of European Research Universities. Prompted by the moderator, Ales Fiala, Head of Unit for RIs at the European Commission, the experienced line-up shared best practices for developing policy frameworks that encourage innovation in an international setting.